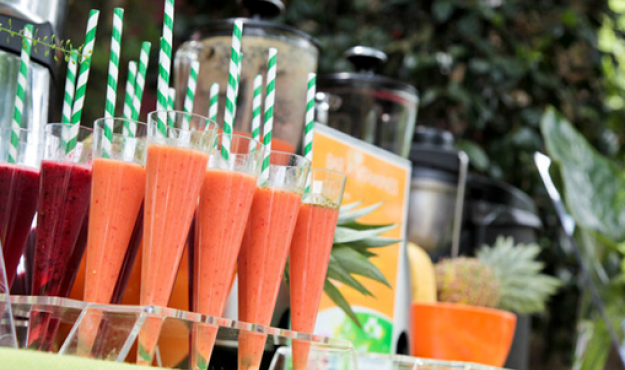 The Smoothie Bar provides natural and fashionably trendy entertainment. appealing to everyone with its delicious, freshly pressed fruit and vegetable cocktails. Each Bar has a smoothie maker with a capacity of 100 litres/hour, a fruit juicer (20 litres/hour) and one or two blenders (a bit noisy, so optional!) They are run by experienced barmen or barmaids, capable of producing and serving up to as many as 60 drinks an hour. If you want a fun, hands-on experience during your seminar, why not get participants to prepare their own smoothies…as a personal or team effort!